Its that time of the year again – IMATS and the Beauty Bloggers conference will be on this weekend in Sydney! This year Beauty Bloggers Utopia (BBU) has replaced the Australian Beauty Bloggers Weekend (ABBW). The difference is that BBU is an exclusive invite only event – there will be only “30 of Australia’s most influential Beauty Bloggers” involved. I’m flattered to be one of them (as you know, part of this blog is dedicated to beauty) and grateful for your continuous support, dear readers, as without you I wouldn’t be there! Also, I wish to thank Sara-May and Lara from Makeup Utopia who went to enormous effort organizing the BBU conference. There will be a series of educational seminars as well as an evening program and formal dinner. So we have to have at least 4 different outfits for the weekend. While my smart casual ensembles are still subject to approval by Sydney’s weather conditions, I’ve already decided on my evening attire. 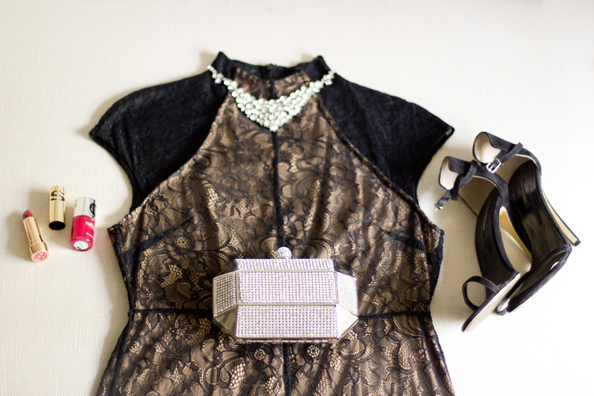 Black lace and white bright! Full outfits will be revealed next week as well as a photo report from the BBU conference. As for now, remember to follow me on Instragram (@crashingred) and on Twitter for real time updates! Beautiful Maria, you’re going to outshine all of us aren’t you? Haha I still don’t have a clutch for the Saturday event so I may have to try and squeeze a sneaky little shopping trip in somewhere on the weekend. Wow love the 2nd outfit! Gorgeous!! I love the outfit you’ve picked up! and btw, I love the pictures of your blog, they are stunning!! I love the 2nd dress. It is simple yet elegant. It is best to wear dresses in simple and elegant styles that will bring out your natural glow and beauty. This makes a woman very attractive.